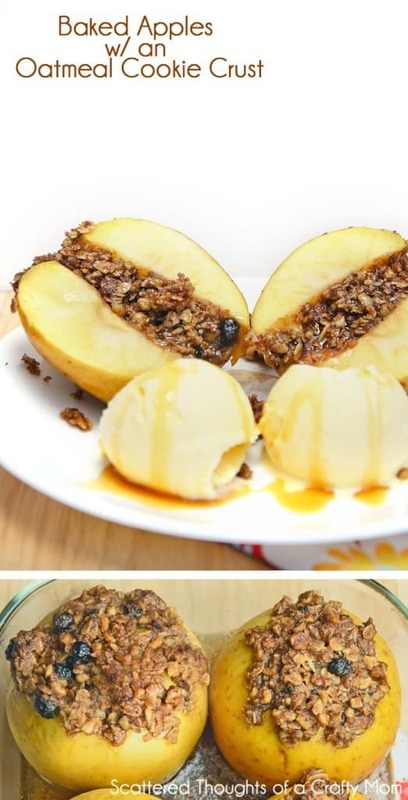 Our very Favorite Baked Apple Recipe: The Oatmeal Cookie Crust makes this a baked apple recipe you don’t want to miss! Plus is a perfect recipe for spending time with the kids in the kitchen. 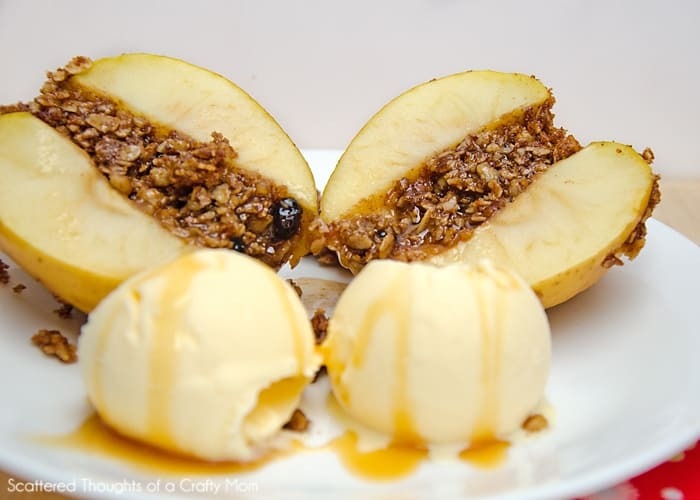 When was the last time you had a baked apple? It’s been a while for me, I remember my mom used to make us baked apples in the microwave when I was younger. Such a special treat and the apples were always so yummy! 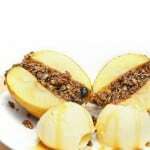 What makes this particular recipe so yummy is the oatmeal-cookie filling and crust on the apple. Served with vanilla ice cream and a little caramel syrup- we were in heaven! Baking times will vary a bit based on the size of your apples and how soft you like them. The apple I used were HUGE and turned out a little on the firm side. Next time, I will let them cook a bit longer. The apples were so large, we got 8 servings out of them! 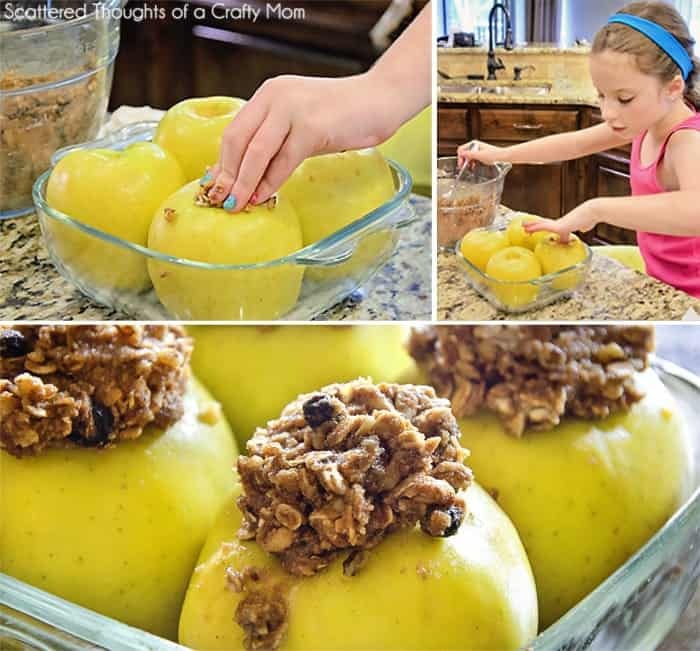 Our very Favorite Baked Apple Recipe: The Oatmeal Cookie Crust makes it a baked apple recipe you don’t want to miss! 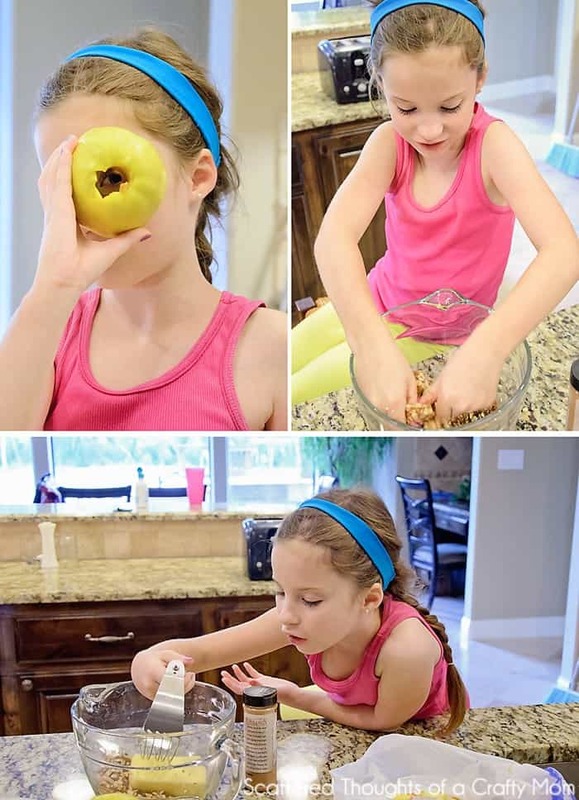 Plus is a perfect recipe for spending time with the kids in the kitchen. Mix together oatmeal, brown sugar, nuts, cinnamon, salt and optional dried fruit. Using a fork, pastry blender or fingers, mix together the oat mixture and butter until the oats and sugar hold together in small chunks. Place apples standing up in a pyrex baking dish, add apple juice to the bottom of the dish. Cover with foil and bake at 375 for 20 minutes. Serve with optional vanilla ice cream and caramel sauce. These look great and apple season is just around the corner! I would love these! Awesome idea! This looks like such a fun recipe! Can't wait to try them this fall. Pinned and tweeting! This looks great!!! I found your recipe over at the Lou Lou Girls link party. I host Tickle My Tastebuds Tuesday and would love it if you would come over and share this recipe. I’m sure our party goers would love it! Here is the link http://bit.ly/1nY3oYQ. Have a wonderful day! I also remember my mom baking apple in the regular oven…then she would cook up some butterscotch pudding on the stove and pour it over the apples…Oh, my mouth is watering just remembering how good it was!! This also looks like a yummy (and nutritious) recipe! Thanks for sharing!